Join the global creative conversation on Climate Change! 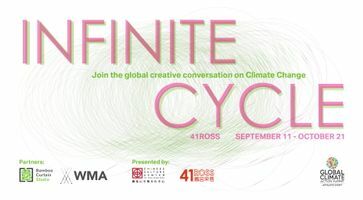 Chinese Culture Center in partnership with Bamboo Curtain Studio of Taiwan and WMA of Hong Kong, convenes diverse voices to address how socially-minded arts organizations and artists leverage civic awareness of environmental issues with Infinite Cycle. The group exhibition explores how art practice and institutional models can be incorporated into the cycle of environmental sustainability, and how it informs and influences the community at large. As an affiliated event of the Global Climate Action Summit (September 12-14, 2018), the exhibition is an invitation to everyone to participate around the urgency of taking action, demanding change, and calling attention to decisions and processes that are dominated by mainstream authorities.